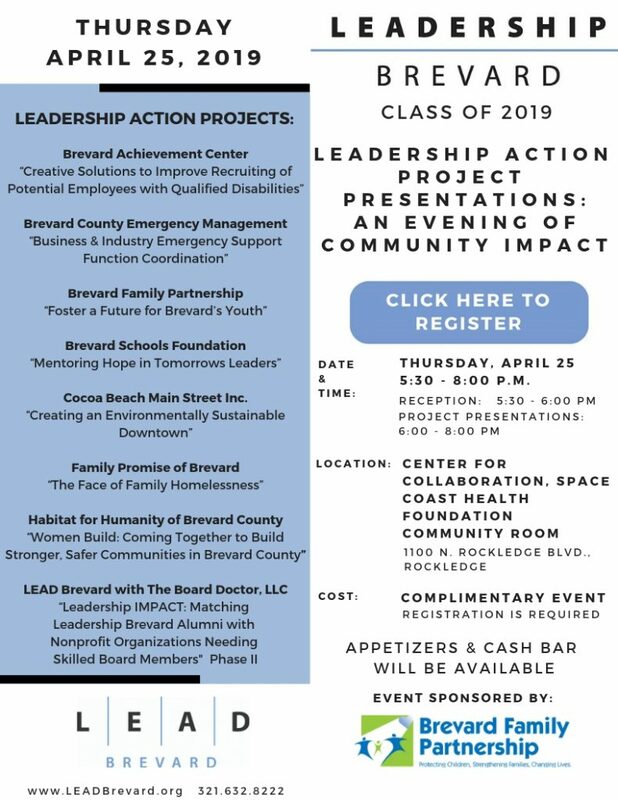 This fall, LEAD Brevard will be entering its 34th year of achieving excellence in leadership in Brevard County by “working together to strengthen our community by inspiring people to lead”, and we need your continued support to achieve this mission. In addition to our programming, all Leadership Brevard class members are required to participate in a community project. These projects are designed to be a leadership learning experience for the participants and a meaningful benefit to the community organization. During its history, Leadership Brevard, the flagship community leadership program of LEAD Brevard, has organized, guided and overseen the successful completion of over 172 Leadership Action Projects (LAP’s). In recent years, the Leadership Brevard class has contributed over 2,600 annual volunteer service hours to the community with an in kind impact of over $64,194* to Brevard. Over 30 years, economic impact totals are over $1.8M!! This project will create a dependable method of reaching and recruiting a robust pool of individuals with disabilities (IWD) to fill all current open positions in a timely manner. One of Brevard Achievement Center’s key strategic growth goals is to double employment outcomes for IWD from 2017-2021; which means employment for 1,702 persons with disabilities (900 more than current). Brevard County Emergency Management uses the Emergency Support Function (ESF) model as the primary mechanism for organizing preparedness for, response to, and recovery from the various threats and hazards that my affect our community. The purpose of ESF-18 (Business & Industry) is to coordinate actions that will provide assistance to the needs of business, industry and economic stabilization, and enhance the community’s ability to restore business operations as quickly as possible. This project will create a coalition of business networks, develop connectivity among those networks and the Emergency Management department, and provide a conduit for information-sharing in both daily and emergency situations. This project will assist Brevard Family Partnership (BFP) in helping to increase the number of quality foster homes by raising awareness of the need for foster families within the community by creating and executing a marketing and outreach campaign designed to educate the public and create solutions to aide in filling this need. The team will work in conjunction with BFP staff to identify specific targeted audiences, create an outreach plan to effectively communicate the need to the intended audiences, and execute the plan. Project participants will assist Brevard Schools Foundation in creating a mentor recruitment campaign to increase community awareness of this program, and grow the number of mentors to pair with low-income, at-risk middle and high school students and help keep them on the path to graduation and post-secondary education. This campaign will consist of shooting, editing and producing a video (emotional, testimonial style) with speakers who are already selected that gives viewers an overview of the type of impact having a consistent and supporting mentor has on the lives of these youth. Cocoa Beach Main Street Inc.
Cocoa Beach Main Street is part of a statewide and national network of revitalization programs. This project will help to improve negative environmental impacts and support conservation and cooperation within our community. The project team will create a strategic plan and implement a conservation program centered on downtown businesses. The goal will be two-fold: encouraging the use of reusable serve ware and packaging as well as begin a downtown business recycling program. This project will require communication and cooperation of downtown business owners, local city government, and community. This project will create and launch an awareness campaign aimed at inspiring a call to action to end family homelessness in Brevard. This campaign may consist of a video, billboard, television, radio and other collateral materials for public advertising and awareness to move our community to action. The project team will build on the data created by two prior Leadership Brevard classes to guide the development of a marketing campaign. Project participants will meet with families who are experiencing homelessness, and major stakeholders like service providers, landlords, healthcare providers, law enforcement and educators to create the concept and narrative for the campaign. The project team will write, shoot, produce, and edit a 2 minute video highlighting the opportunity in Brevard County to volunteer with Woman Build and Habitat for Humanity. The video is intended for Habitat for Humanity to use on their website, social media and as part of community presentations. This is Phase 2 of a concept to develop a way to match nonprofit organizations in Brevard County with Leadership Brevard alumni and others who are willing and ready to serve on a board of directors. A Leadership Action Project team of the Leadership Brevard Class of 2018 initiated Phase I and completed many of the deliverables outlined in the initial project. Phase 2 includes recruiting potential board members among the ranks of alumni as well as the Class of 2019 and gathering and entering their interests and skills related to board service into the system ‘database’; offering additional board governance training to interested alumni (marketing of the existing workshop offered in January 2019); and facilitating some initial matches and introducing nonprofit organizations to potential board members. …to provide pet food to homebound Meals On Wheels clients and participants in the Seniors At Lunch congregate dining program. The project will create a system for identifying participants and type of food needed, organizing volunteers and tracking with an ultimate goal of making this a volunteer-run program. BAC is aware that not all of their clients parents (primary care giver for the 150 adults with disabilities served by BAC) have end-of-life plans in place to ensure the on-going health, safety and wellness of their adult child with disabilities. Goal 1– create a survey instrument to assess current end of life planning, following HIPAA requirements. Goal 2 – create, with staff support, a specific action plan to present to BAC board with tactics aid greater numbers of families in overcoming barriers to create end of life plans. The project is intended to analyze and assess the present situation in Brevard County and propose both short and long term strategies to improve. The project team will interface with organization and individuals in the community who are aware of the challenges and committed to meeting them. Recommendations may take the form of policy changes, collaborative investments and communication efforts. The deliverable is a report and presentation presenting findings and suggesting next steps. Write, shoot, produce and edit a 2 minute video highlighting the need in Brevard County to help feed children who are going hungry on the weekends. The video is intended for use on the agency website, social media as part of community presentations. Currently, the Children’s Hunger Project is distributing packages of food to 1500 children at 36 elementary schools; their research shows that the need in our county is over 3000 children. Currently, 300 children appointed to GAL have no volunteers to assist them. The program is committed to providing leadership roles for their volunteers; short term goal: identify barriers for Volunteer Team Leader recruitment – Intermediate goal: increase the number of trained Volunteer Team Leaders, recruit and retain 25 new leaders by mid-2018 – long term goal: empower volunteer team leaders to help recruit new volunteers and help in the retention of current volunteers. Junior League of South Brevard, Inc. Girl POWER will consist of free workshops conducted throughout the year once the project is launched (self-esteem, nutrition, leadership and mentoring for young women ages 16-21). The project revolves around planning the introductory symposium in April 2018; potential sessions proposed include personal finance, self-esteem and body image, preparation for the job market and personal safety (including internet). The concept is to develop a way to match nonprofit organizations in Brevard County (over 1,695 with 501 c 3 status) with Leadership Brevard Alumni and others who are ready and willing to serve on a board of directors. Project elements would include gathering information from nonprofits about their board needs, gathering information from alumni about their interests and skills, marking some initial matches, building a type of interactive web based ‘data base’ or means of ongoing match services and creating a plan for long term sustainability, which will include identifying a revenue stream for long term support.